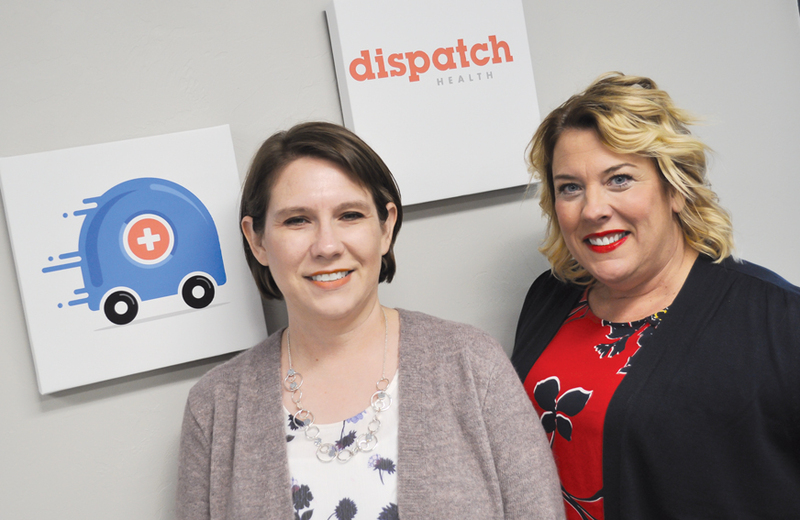 Amy Evans and Tiffany Traxler are helping bring an exciting new health care delivery option right to your door with Dispatch Health. You feel something coming on. But what next? You can call your doctor and hopefully get an appointment sometime in the next couple weeks. Or you can get in your car and head to the local urgent care clinic and wait with 20 or 30 others doing the same thing. That’s what Dr. Mark Prather thought in 2013 when he came up with a unique service model that would eventually become DispatchHealth. “Really anything you can think of you would get in your car and go to urgent care for but more,” Dispatch Community Engagement Manager Tiffany Traxler said, explaining the service that has recently expanded into the metro. DispatchHealth is bringing back the house call with a modern technology twist. DispatchHealth gives patients ways to access convenient, high-quality acute care in the comfort of their home at the time of need. The concept dates back to 2013 when Prather was running the emergency department in Denver for Centura Health. Working with the ambulance service through the 911 system, Prather helped more than 400 patients in 18 months in the comfort of their own homes. The total cost savings to the health system was more than $1 million. But saving patients the time, expense and hassle of an ER visit was priceless. The model has spread like wildfire to Colorado Springs, Richmond, Phoenix, Las Vegas, Houston, Oklahoma City, Tacoma, Dallas and Springfield. Blue Cross and Blue Shield – one of Oklahoma’s largest insurers – quickly saw the value. For some that can mean an urgent care visit in their home for less than $50. Dispatch also provides medications such as: anti-inflammatories, IV antibiotics, IV fluids, prednisone, lasix, antiemetics, flu medications, laxatives, stool softeners, heartburn prevention, glucose gel, anesthetics, migraine cocktail, antihistamines and more. IVs can be placed and fluids begun all in your home. Breathing treatments can also be administered. Last year’s influenza outbreak was one of the worst in nearly a decade and the severity of the outbreak was extreme. In fact, The Center for Disease Control and Prevention (CDC) recorded over 20,000 positive flu tests per week at the height of the outbreak. While most seek treatment at an emergency room (ER) or urgent care clinic, when leaving one’s home the virus can be immediately exposed to others and cause further spread of the flu. Also, ERs and clinics can easily become overwhelmed with a high number of sick patients during flu season, leading to overcrowding, lengthy wait times and even physician burnout. Adults can infect others one day before their flu symptoms even develop and can pass on the virus up to a full week after becoming sick.